renae | Sophisticated Diva ~ A.K.A. Along came Polly! Welcome Miche November 2012 Shells, Accessories!! Drumroll please!!!!! 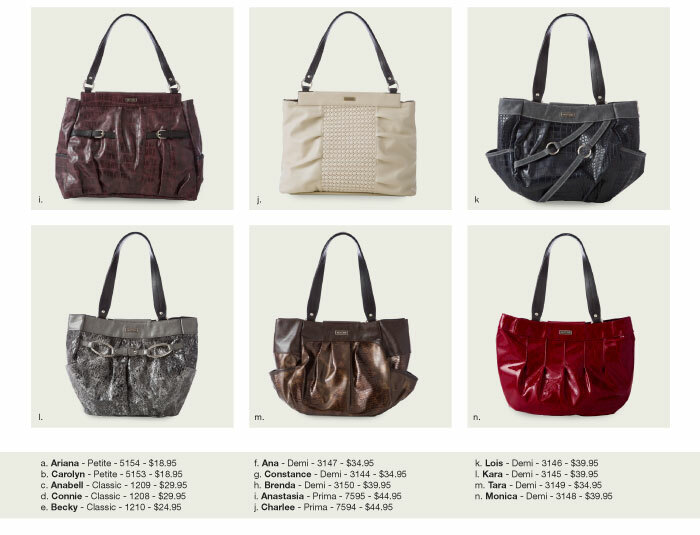 Welcome the November 2012 Miche releases!! These gorgeous shells and accessories (new handles, wristlets, hip bag ) will be available November 1, 2012 at https://diva.miche.com — I know you can’t wait!!! Some great Christmas shopping ideas lie within this page! Which one is YOUR favorite?? Carmel Classic Miche luxe shell-retired. Quincy, out of stock! UPDATE 10/22/12 10:00am cst THESE SHELLS SHOWED UP ON OUR WEBSITES AGAIN THIS MORNING– HOWEVER OUR COMMUNICATION STATES THAT SUPPLIES ARE CRITICAL~~~NOW IS YOUR CHANCE TO GET CARMEL BEFORE THE SHELL RETIRES. CRITICAL INVENTORY IS DEFINED BY “WILL SELL OUT WITHIN ONE WEEK, OR LESS”! Quincy, the Prima Luxe shell is depleted in quantity, however there is an estimated re-stock date of early November ~ if this shell is on your wish list, stay tuned! I’d hate to see those that wanted it miss out on the second (and perhaps only) opportunity to grab it once it’s released again! Miche LUXE shells are fabulous gifts, and Christmas is rapidly approaching! Miche HOPE RED demi shell ~LIMITED inventory – then retired! 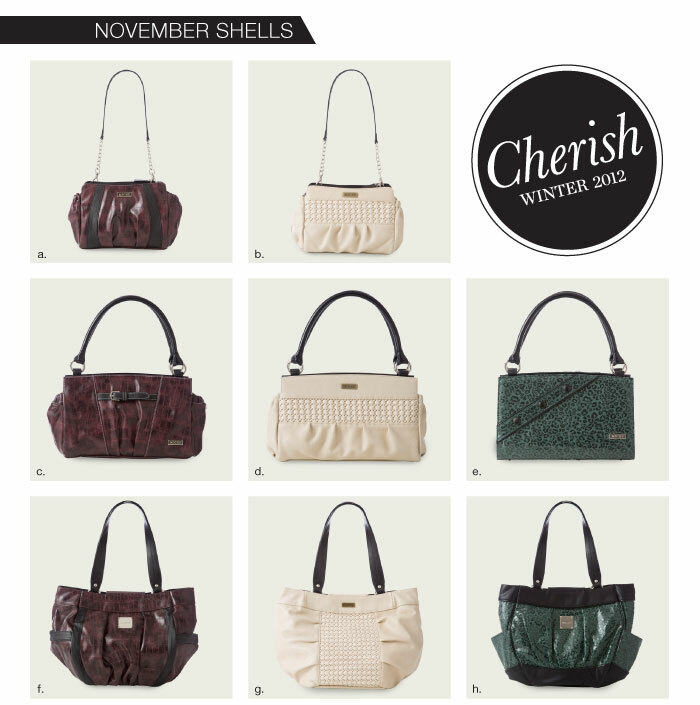 Looking forward—Miche November 2012 shell releases, Winter catalog~coming soon!! We’re wrapping up October’s DOUBLE HOSTESS CREDITS for any party that closes prior to October 31st, and ONLINE PARTIES ARE WELCOME!! Remember, a party needs only $200.00 to qualify for hostess benefits!! Contact me at sdhmhandbags@aol.com to schedule your in person, or ONLINE PARTY!! Miche makes a fabulous gift for the Christmas season!! Is there a handbag lover on your list?? We have the LOVELY Miche snowflake shell available NOW!! This shell comes in petite, classic, and demi–and will take you through the entire winter season!! Handbag storage and care for your Miche bag can assure you years of enjoyment~although our handbag and shell system is fully interchangeable, and you can replace any part of your Miche bag at any time, there are always favorite retired shells that are not replaceable: Proper care should ensure that you’ll be able to enjoy your Miche for years to come! Thankfully, Miche provides a great alternative and solution for those of us that have a tendency to be “hard on handbags”. Should an extra set of handles or a shell need replacement, you only need to replace that one part of the fully interchangeable ensemble-not the entire handbag! Miche makes sense! Sharp objects. Nail files, scissors, or uncapped pens can tear a lining. Loose makeup and liquids, including hand sanitizer. Keep them in a separate plastic bag to prevent leaks. Anything smelly (gym clothes, a sandwich). Odors can linger. Spare flats. They should always be kept in a shoe bag to protect the rest of the contents from their dirty soles. To preserve your Miche shells, avoid contact with your shells after using hand sanitizer, and store your shells in the MICHE SHELL ORGANIZERS. If storing without the organizer, use white tissue paper between your shells, and store as they were shipped originally, folded once. Spot cleaning with water only is recommended, if necessary. Miche bundle prices available on any order greater than two regularly priced shells, and base with 2 shell combination! 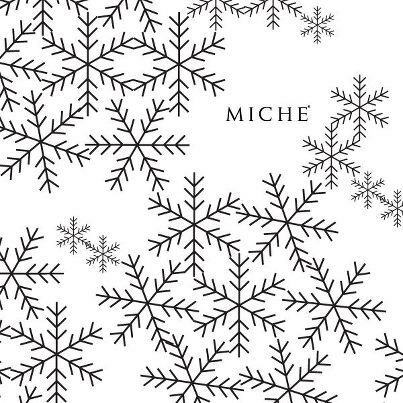 Miche October 2012 SNOWFLAKE holiday shell!! Announcing the release of the OCTOBER MICHE “HOLIDAY” SHELL!! I truly love this shell for two reasons—the delicate little snowflakes—and the fact that the shell can be used during the ENTIRE WINTER SEASON! As soon as YOU are ready to accept the snow, you can dress your base with this beauty! It’s almost like Christmas already!! These shells are LIMITED EDITION~While quantities last! MORE SPECIAL NEWS FOR OCTOBER~~October is National Breast Cancer Awareness Month, and Miche is committed to helping eradicate this and all types of cancer through our Hope program. Miche is giving The Gift of Hope this October—receive a FREE Hope Charmer ($12.95 value) with the purchase of a Hope (red) in Petite, Classic and Prima sizes or Hope (black) in either the Classic or Prima size. It’s Miche’s thanks to you for helping spread Hope all year long! The Hope Charmer (9701) is the only eligible free item for this promotion and cannot be substituted with other Charmers. Hope Shells must be purchased individually (not as part of a bundle) in order to get the free Charmer. There is no limit to the number of Hope Shells you can purchase and you will receive a free Hope Charmer for each Shell purchased. Promotion applies to all orders submitted from October 1–October 31. If a Party was opened prior to October 1 but is closed during the promotional period, all orders that include selected Hope Shells qualify for the free Charmer. Would you like to hostess a home show and earn free and discount Miche? Contact me today to find out about my hot October dates—if you hostess in your home, salon, or office, during these dates, I have a very special incentive for you !! This is my way of thanking YOU for allowing me to share Miche with your guests! CLICK HERE to see the customary hostess benefits! Go ahead and see double—this time it’s a good thing! The rewards for hosting a Miche Party are already amazing—yoU can get many of YOUR favorite products FREE or at a discount. September 25–October 31, 2012. All orders must be placed and Parties closed and submitted by Wednesday, October 31, 2012 at 11:59 p.m. Mountain Time. With the Double Hostess Rewards promotion, you get twice the Hostess credits and twice the half-price Shells with a qualifying Party of $200 or more. For example, if your party sales total is $600, you get an additional $60 for a total of $120 in Hostess product credit. You also gets to purchase four (4) half-prices Shells instead of two (2). What a great way to head into the holiday season! THIS is the monthly special~ it’s a great discount on classic Miche bases, and we have an entire section for clearance Miche shells on my website too!! I’d love to have you come visit, and like my page Sophisticated Diva-Unique Handbags and accessories— The about tab will tell you what you’d like to know about Miche….the notes tab has information about becoming a Miche rep~ there are only 15000 reps in the US, so this is truly a ground floor business opportunity! Many of you are wondering what’s coming up for October 2012 with Miche——–here’s a hint (wink wink) STAY TUNED! !